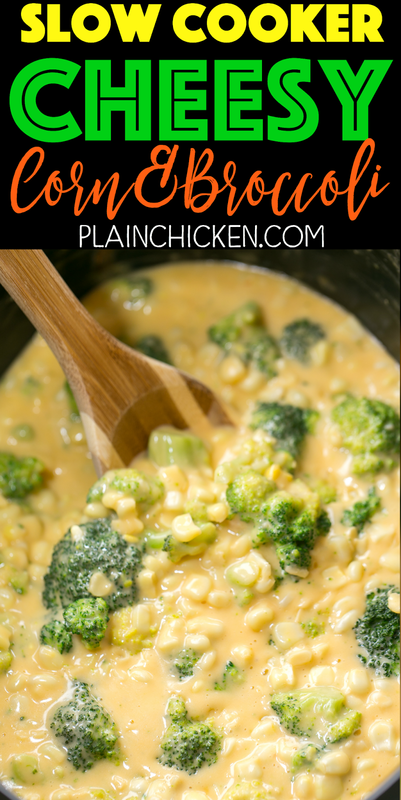 Slow Cooker Cheesy Corn and Broccoli - our favorite side dish! 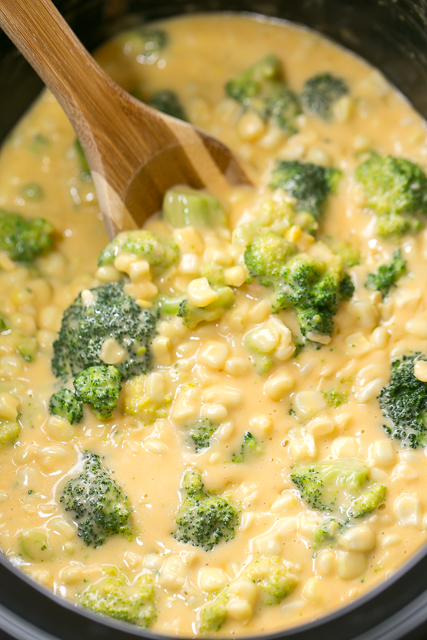 Corn, broccoli, Velveeta, cheddar cheese, cream of chicken soup and milk. Just throw everything in the slow cooker and let it work its magic. Can add ham to the slow cooker and make this a main dish. 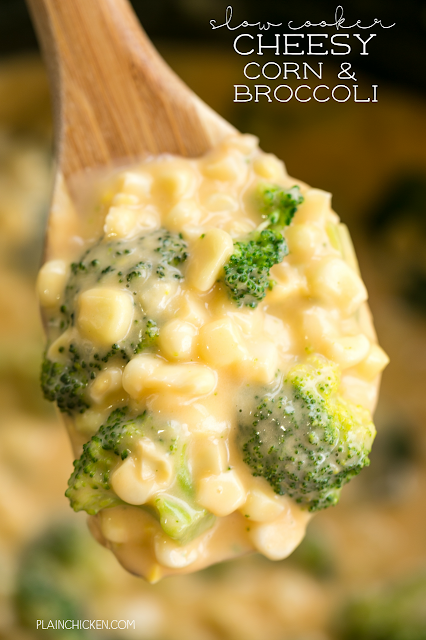 Everyone LOVES this cheesy side dish!!! 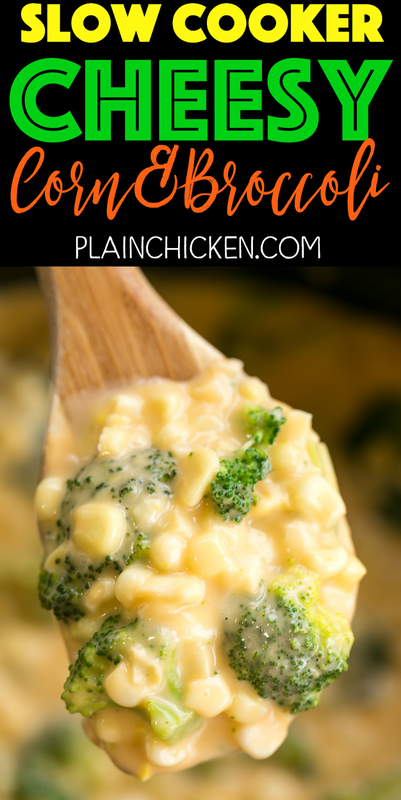 This Slow Cooker Cheesy Corn and Broccoli is a favorite in our house. It is so easy and it tastes great! Just dump everything in the slow cooker and let it do its thing. We serve this as a side dish, but you you also throw some ham in the slow cooker and make this a main dish. Either way, I am sure this will be a hit! This is ready in about 3 or 4 hours. If you are in a hurry, you can crank the slow cooker up on HIGH and it will be ready in about 2 hours. I've cooked it both ways and it works great either way. The cheese sauce uses Velveeta. I know some of you don't like to use Velveeta for whatever reason. I haven't tried this without the Velveeta, so I don't know how it will work with another cheese. We like Velveeta. It melts wonderfully and makes great sauces. I used the new Mini Blocks. This recipe only needs 4 ounces of Velveeta and that is equal to one of the new Mini Blocks. Combine all ingredients in slow cooker, stir. Cover and cook on LOW for 3 to 4 hours. Stir before serving.